The Constitutional Bus Tour is a comprehensive City Tour we provide on your group’s buses . The tour is 60-90 minutes (depending on traffic) and features the historic area, as well as other sites in the city such as the Ben Franklin Parkway, Comcast Center, LOVE Park, City Hall, Penn’s Landing, Chinatown, the Franklin Institute, etc. We can make a stop to get off and run up the “Rocky Steps” or to see the Comcast Center’s High Definition Video Wall. 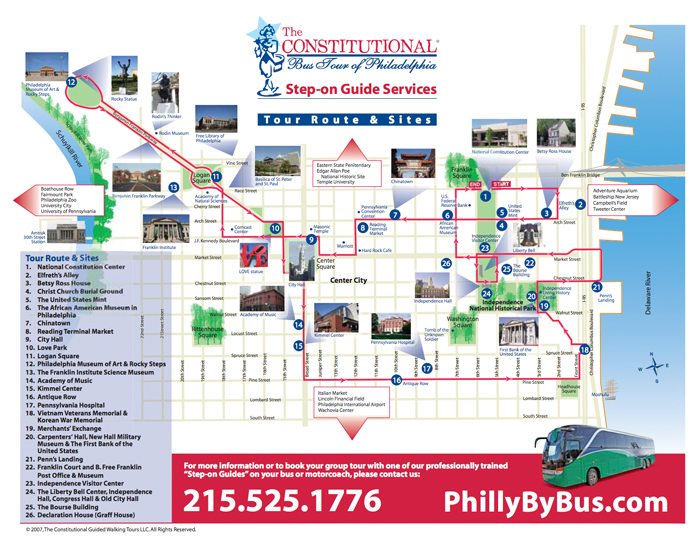 The Constitutional also offers groups the opportunity to take a full City Tour by bus (on your group's bus) and then take a more in-depth walking journey through Historic Philadelphia on The Constitutional's signature walking tour. The Constitutional Bus Tour visits more than 26 historic sites and attractions on a river-to-river City Tour aboard your group's motorcoach. The Constitutional Walking Tour provides a primary of the Independence National Historical Park area and visits more than 20 of Philadelphia's most popular sites including the Liberty Bell, Independence Hall, the National Constitution Center, Betsy Ross House, Franklin Court, etc.